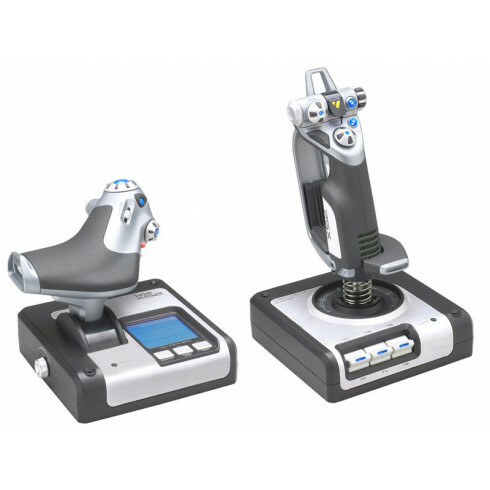 The Saitek X52 is developed using customer feedback from their award-winning X36 en X45 stick and throttle controllers. The joystick and throttle have an ergonomic design for very accurate and realistic flying. With this set it’s as if you’re in a real cockpit. The throttle features a big LCD display, which shows command names, a clock and stopwatch. Featuring 23 buttons, three 8-way hat switches and 7 control axes, the X52 gives you 47 basic commands plus the control axes. But when you include the programming options provided by powerful Saitek Smart Technology programming software, which allows you to make use of the 3 position mode switch and Pinkie shift switch, the total number of programmable commands rises to 282!